The South East Councils Climate Change Alliance is set to expand a pilot sustainable homes program currently operated with Stockland at the developer’s Selandra Rise estate on Melbourne’s outskirts. SECCCA was awarded a $330,000 grant by the Victorian government through the $20 million New Energy Jobs Fund to expand the service – which assists new home buyers with information on engaging builders to achieve more sustainable dwellings – to other greenfield developments. Implementing the program’s suggestions could help homeowners achieve a home that uses up to 60 per cent less energy, Victorian minister for energy, environment and climate change Lily D’Ambrosio said. It is the first of 24 grants that will be announced in the coming months through the program. Daniel Pleiter, SECCCA projects coordinator, said the organisation hopes the program can achieve broader changes to the practices of builders and developers, and also provide evidence to back changes to the building code to improve residential dwelling performance. SECCCA comprises eight councils – City of Casey, Baw Baw Shire Council, Bayside City Council, Greater Dandenong, Bass Coast, Cardinia, City of Kingston and Mornington Peninsula Shire – and many of the councils have fast-growing new suburbs on their outer fringes. The sustainable homes project was developed to address the lack of buyer knowledge on sustainability performance in regards to greenfield development. It also aims to increase greenhouse gas abatement and climate change adaptation outcomes. In extending the project beyond Selandra Rise, builders and developers engaged in new projects will be approached to partner with SECCCA for delivery of the program out of their display homes or sales suites. “The best time to reach people with sustainability information is before they sign the contract,” Mr Pleiter said. He said a first home buyer was generally “in the hands of the experts around them”, but that a lot of builders do not even mention sustainability initiatives or offer them as upgrades. The builders are obligated to achieve a six star NatHERS standard, but that is not going far enough, Mr Pleiter said. Research carried out by SECCCA using blower door testing and energy bill analysis for newly built homes has also shown that while houses are rated as six star, many are only achieving two or three star performance outcomes. He said this raised a question of ethics, as consumers were paying for the costs associated with achieving six star but not getting the outcome. 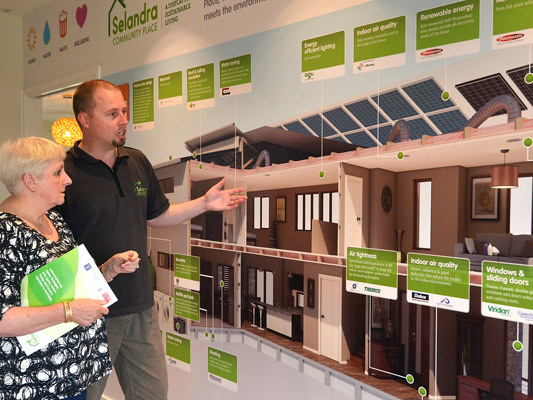 The information showcased at the Selandra Rise sustainable display home at Stockland’s development in the City of Casey amounts to around $15,000 in additional investment by buyers, and this has a payback period of around seven to eight years from estimated energy bill savings of between $2000 and $2500 a year, Mr Pleiter said. He said that it is information most buyers don’t have, but when it is explained it is “just common sense”. One of the first steps, which is without capital cost, is achieving proper orientation for passive solar benefits, he said. He said up to 50 per cent of new homes in developments were simply oriented the wrong way, and orientation was not something most builders were explaining to clients or making part of business-as-usual approaches. Mr Pleiter said the organisation eventually wants to see solar orientation added into the building standards as mandatory. The second step SECCCA recommends is increasing insulation in roof areas to R6. Double-glazing is also recommended. Mr Pleiter said the price of double-glazing had dropped to near price parity with standard glazing, but it was not being offered as standard by most builders. This is another element SECCCA would like to see made mandatory in the building code. Shading for windows exposed to summer sun is also recommended. Then there’s quality of workmanship to look at. “The missing link now is draught-sealing,” Mr Pleiter said. The gaps and holes that can compromise a home’s thermal and energy performance are often the result of poor workmanship, he said. The sustainability information tells homeowners what to expect from their builder in this regard. Buyers are given information about blower door testing, and details of possible suppliers for the service. Mr Pleiter said it was often the hardest initiative to “get across the line”, as many builders were reluctant to include it in the contract and proof of proper sealing is not mandatory or regulated. But if you can get that sealing done properly, in combination with the other initiatives, you get ideal performance, he said. Another thing buyers should look to do is not say yes to suggestions of ducted or evaporative cooling and heating systems as part of the build, he said. Not only do these add multiple penetrations that reduce building performance, they are expensive in energy use terms and add to the overall cost of the build. Mr Pleiter said that with a home that performs properly on the passive level, buyers can live in the house for a few months and then choose to install only as many energy-efficient reverse cycle split system units as experience tells them is required. Another reason to install them independently is that builders can quote an “outrageous” price for installing multiple split system units and also may tend to “over-engineer”, he said. So buyers can make savings on HVAC installation and also have an energy bill saving. The same recommendation holds for solar PV systems, Mr Pleiter said. Live in the house for a full quarter and then invest in a solar system that is right-sized for the energy use. Home buyers are encouraged to bring their builder’s proposed plans along, and advisors help them determine what is needed to meet their household’s lifestyle and space requirements. This can help find ways to absorb the cost of any sustainability upgrades by things such as a slight downsizing of space, removing expansive decking or other modifications. There are other savings than can offset upgrades, Mr Pleiter said, such as no longer needing to spend money on heavy window furnishings for thermal control because the double-glazing makes them redundant. The design becomes an element that is worked into the overall budget, he said. As well as energy bill savings, the combined initiatives have substantial co-benefits for homeowners, including a more comfortable, quieter home that gets winter sunshine in the living areas and is better for the environment. The pilot project had already attracted interest from other councils, with Geelong and Wangaratta both using elements of it. One of the benefits is that it does not need a purpose-built facility, Mr Pleiter said. The whole information scheme can be co-located with a builder or developer’s own sales suite or display home, or even out the front of a garage. It is hoped the expansion of the project could have national reach and benefits, he said, as the initiatives are applicable around the country. He also thinks in the next few years it could become mandatory for homes to be proven to perform at the six star standard, not just rated on design. As part of gathering evidence, willing participants will also be followed up within 12 to 18 months of moving into their new dwelling to find out what they have implemented and what their energy bills have been. One of the aims for the expansion of the program is to provide evidence for “sensible policy-making”, he said. The benefits for home owners would be lifetime energy bill savings for 30 to 40 years or more, and dwellings that are better placed to adapt to the greater incidence of heatwaves expected with climate change. Mr Pleiter said ongoing dialogues with developers and builders will be assisted by the project generating evidence of buyer demand for sustainability coupled with the willingness of purchasers to pay for the initiatives. For builders, it is a no-added-cost proposition, as they still obtain the same margins on any sustainability upgrade element. “It should be business as usual,” Mr Pleiter said. I have just added this article to our Facebook discussion group “My Efficient Electric Home”.